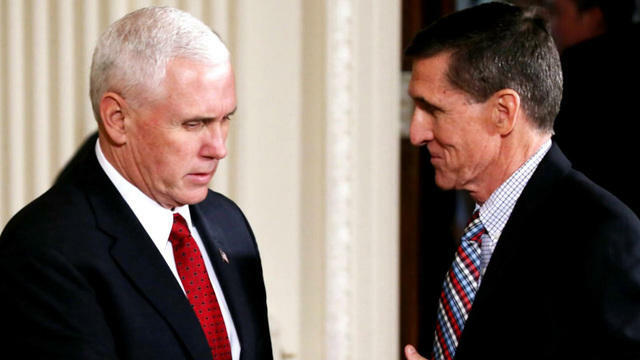 WASHINGTON -- Vice President Mike Pence said Thursday that former national security adviser Michael Flynn’s work to further the interests of the government of Turkey is “an affirmation” of President Donald Trump’s decision to ask for his resignation. White House press secretary Sean Spicer said Thursday that Mr. Trump was not aware of Flynn’s ties to Turkey before appointing him. Spicer’s comments came two days after Flynn and his firm, Flynn Intel Group Inc., filed paperwork with the Justice Department formally identifying him as a foreign agent and acknowledging that his work for a company owned by a Turkish businessman could have aided Turkey’s government. Flynn’s disclosure that his lobbying - from August through November- may have benefited Turkey’s authoritarian government led by President Recep Tayyip Erdogan came as Flynn has drawn scrutiny from the FBI for his contacts with Russian officials. Trump fired Flynn last month for misleading Vice President Mike Pence and other administration officials about his contacts with Russia’s ambassador to the U.S., Sergey Kislyak. “There’s nothing nefarious about doing anything that’s legal as long as the proper paperwork if filed,” Spicer said. He declined to say whether Trump would have appointed Flynn if he had known about the lobbying. Under the Foreign Agent Registration Act, U.S. citizens who lobby on behalf of foreign governments or political entities must disclose their work to the Justice Department. Willfully failing to register is a felony, though the Justice Department rarely files criminal charges in such cases. It routinely works with lobbying firms to get back in compliance with the law by registering and disclosing their work. Flynn Intel and S.G.R. LLC Government Relations and Lobbying pressured congressional aides to investigate a cleric who Erdogan had accused of directing a botched coup last summer. The two firms orchestrated meetings with U.S. officials- including congressional staffers and Arkansas Lt. Gov. Tim Griffin, a Republican - as well as journalists. They also worked on research, informational materials and a video on the cleric, Fethullah Gulen.